And yet (God bless her!) is mild and meek. Haunts me, and makes me appear so small. Stoop’d in her wisdom and married me. And in City circles I say my say. By the idle breath of the social air. A filigree tale in a paper cover. What could your wisdom perceive in me? Love one another so utterly? As ever poet of sentiment sung about! As foolish and happy as he or I! And, presto! fly! goes her wisdom then! The cleverest fellow on all the earth! Even to think me a dunce at all! And the silly pride in her learnëd face! The happiest fool that was ever born! ‘Hermioné’ was published in The Argosy (December 1865 - No. 1, pp.47-49). VERNER, called the Raven, a Norwegian barbarian, in arms against King Oluf the Holy. ORM. His Son, a boy. PLACE: Norway. PERIOD: The reign of King Oluf, called the Holy, who forced Christianity on his kingdom with fire and sword. SCENE: THE SACRED GROVES. High Druid Arches, surrounding an Altar, on the steps of which crouches VANA the SORCERESS. In the far distance, Mountains of Snow. A Dark Night, with the Moon driving through the Storm-Rack. Close to the Altar, gazing upward, EBBESEN. Distant thunder. Like to a skeleton equip’d in steel! To Verner and your children! Enter, hurriedly, ERIK and BJÖRN. BJÖRN. He stands beside the Altar!—Ebbesen! EBBE. Whence come ye in such haste? Our enemies are not human! And striking down in fire! ULV. Say, where is Verner Ravn? Started to life, he rushes hither. VERNER rushes in, and prostrates himself before the altar. VANA stirs, watching him intently. When victory was so near! They grasp it not to wither up the foe! VANA creeps forward, gripping the arm of VERNER. Communing with the dead. They answer’d me. VANA and EBBESEN go up. ULV and ERIK whisper. If it be fatal, fly to Oluf! ULV. Yea,—with the head of Verner for a gift! Will guard our lives against the gods of Verner! [They retire. Shall droop and break and fall like stalks of corn. This battle-bruiséd body? (ORM passes.) Who goes there? ORM. Yea, father, Orm, thy son. Where thou didst leave me yesternight. The battle in thy hands. VERNER. She prays in vain! The gods are angry with thy father, Orm! And hounded like the bird of prey I am! (Aside, watching ORM earnestly) Can it be thus ye answer me, O powers? Would crack beneath the sword his father wields? Some glimmering of thy father’s soul beneath. Hast thou a warrior’s heart? Art thou prepared to die? With bloody footprints round us in the snow. Be silent! Is thy heart a craven, Orm? VANA interposes, gazing sternly at VERNER. Is light as clouds upon a summer heaven! The pale gods see that she is beautiful! As holy offering demand her. (A thunder-clap.) Hark! That made a holy radiance round thy sleep! Part of the very motion of thy limbs! Echoing thee!—Arouse, and follow me! VERNER. Helga!—O gods, be pitiful! The ordeal is reversed, and Oluf falls. Lo, steel thy heart and gain immortal life! Lay bare the Altar, and uplift the knife! And crave the aid gods dare not then deny! [Exeunt. The clouds thicken. Thunder and lightning. Lest we shriek and die! To our thrones of snow. Is our breath and life. With a sound of wings! Is our breath and life! Lest we shriek and die. [The voices die in the distance. The scene grows lighter. Of gods at strife. How cold it is! how still! Beyond the clouds. I would that Orm were here! Than this dark silence. Hush! What sound was that? VERNER (without). Hoa, Helga! Helga! VERNER (aside). She is here! (Aloud) Come hither, child! The lightning lights thy brow, and thou art he! Why dost thou turn away, and hide thy face? And—and—I fear thee!—See, thine eyes gleam strangely! That thou art frowning on me! The love I bear thee as I frown. Fear nothing! Where stir the powers who heed me not. But hush! HELGA. Only the whispering wind. VERNER. The gods are out across the heavens to-night. HELGA. Why dost thou grip me so? VERNER. Angry with thee, Helga! I am a woman when I look upon thee! Teach me to hate thee! To rob me of my strength! The sorcerer Oluf hath a spell upon thee! I have sworn a dreadful oath. HELGA. What hast thou sworn? For ever in this darkness. VERNER. I am mad! and the gods have made me mad! HELGA. Thou shalt do so! Sleep—with thy dear head pillow’d on my knee! Will wake and bid thee fly. Am I a wolf?—I am hunted like the wolves! HELGA. Something is glittering close before mine eyes! HELGA. Something cold is pressed against my cheek! Thou wouldst not harm me! VERNER (releasing her; vacantly). Harm thee? Nay, not I! I am foolish, and I knew not what I said. Is there no refuge from this thing, O gods? Even the hunted Raven loves its young? And leave us sightless in the happy dark! In wings of blinding gold! VERNER (leaping up and seizing her). I have thee now! Until the deed is done. This way! this way ! HELGA. Help! What wouldst thou do? Grip me not so . . . thou hurtest me! VERNER. Ay, the gods demand it! The radiance of the sweetest eyes that live. HELGA. Thou canst not kill me! Kiss me, and were thine eyes not dim with tears? Thou art my father! thou didst give me life! To those strange gods who led thee forth a-field! And many a simple jest to make me smile. And frights me thus in sport. Bloody and torn from battles. (Aloud) Child, prepare! For miserable lives . . . Now, turn thy face! VERNER (dropping knife). O ye gods, ye gods! I will not do this deed! [He falls, weeping, with his face to the ground. HELGA clings to the altar, looking upward. Full daylight. As we melt and die! [The music dies away as the scene closes. ‘Verner Ravn: a Drama’ was published in The Argosy (December, 1865 - No. 1, pp. 69-79). “But is it true, my father? One needs must seize it then! And the door was open thrown. But in his eyes strange light. With which he looks around. * Skaltegraveren—signifying the digger after hidden treasures. “It is so cold without there! I am so stiff with cold! They gaze in fear the while. Ere he glimmers through the door. Where the dumb dead men sleep. And gains the place of death. In the faint and yellow rays. Labour’d these arms of mine. I bleed! the clock strikes midnight! The coffin to his breast! Hark, how the death-clock chimeth! O Jesu, give him rest! “Raise him!” the peasants said. He smiled—and he was dead! 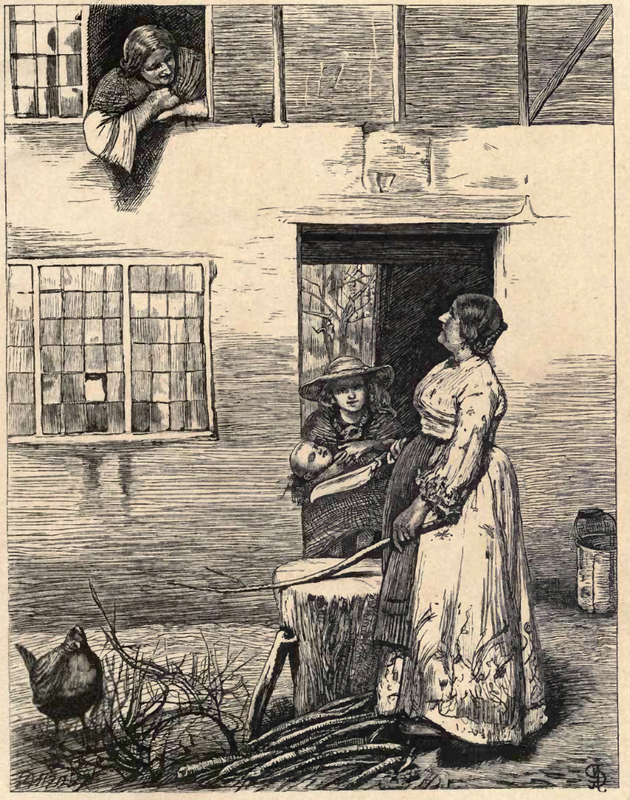 ‘Romance From The Danish: The Treasure-Seeker by Œhlenschlager’ was published in The St. James’s Magazine (December, 1865). In the previous month’s issue ‘Newton Neville’ had published an article entitled ‘Danish Romances’ which had included several other of his translations from the Danish. ‘The Treasure-Seeker’ is also included in Buchanan’s Ballad Stories of the Affections: from the Scandinavian, published in December 1866, in fact it is the only poem translated by both Buchanan and Neville, and the translations are completely different. AY! there is Silly Nanny with the child! We’ve a hard pull to manage such as he! And Nanny, though she’s witless, does the rest! Though Nature stinted her, her heart is sound. And he feels shamed to use his brains so ill! The drink is conquer’d, he has warm’d to me! And leave a man’s own love to do the rest! 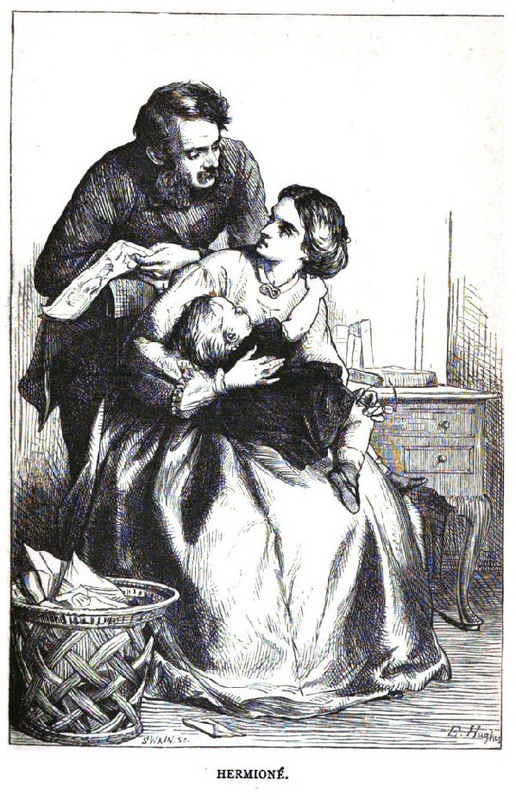 ‘At The Threshold’ was published in A Round of Days (George Routledge & Sons, 1866). OLD WINKELRED AND THE DRAGON. Munch’d men and women, old and young. In the mountain he guarded a treasure bright. And who the treasure will raise and win? But the treasure could free the whole wide land! Has stained the mouth of the den with blood. While the champion’s armour and breastplate burst. Who thirsteth his manhood to prove in fight. But his heart is of different hue, I trow. As the glacier glistens his shirt of mail. Eleven have by the dragon died. Where was a knight so bold to be found? The twelfth son play’d with his shield on the ground. “Till I am big, let the beast alone! And snatches the little boy to his breast. But hell has plenty of dragons in store! It gleameth by day, it gleameth by night. At the mouth of the cavern stands Winkelred. With your sons in my hole do you wish to lie? In the cavern a terrible fight began. ’Mid flames, black darteth his poisonous tongue. “Truce, champion! cause me no further pain! And the bones of your sons you shall have again! In his flaming throat plunged the fatal sword. For the treasure dug conquering Winkelred. ’Tis a spear of iron, wondrous and old. He has proved his manhood full well, I vow. Honour’d let the champion be! He has freed the land from its slavery! Chains are broken, and bonds untied. Full often ’tis wielded in Ledinsdrun. When ’twas won by Winkelred the bold. And ’twas hung above him when he was dead. While power and freedom on earth are found. ‘Old Winkelred and the Dragon’ was published in The St. James’s Magazine (January, 1866). And the pine trees creak in the gale. And the bones of the sacrificed make a moan. And around the corpses dance. His monks to the rocky land. But Olaf scatters them far and wide. But take this offering of mine! As on Rota’s bosom it shrieking springs. And fortune walks by his side! Before him Hakon the mighty flies. With Karker * his freed thrall. Then he falls to sleep in the dead of night. The red god Harmod† stands. And the Christ shall fall by thy hands! Freya is weeping tears of gold! * In the original the name is Thormod Karker; i.e., Karker against Thor. † The messenger of the gods. “Fright the thunderer’s thunder, thou trembling slave! Why growest thou chill and cold as the grave? And the worn-out Hakon slumber’d again. Do I feel thus strange to-night? And trembles, and cuts the throat of the Earl! King Olaf and his men. To return no more to the north. Bloodless churches and cloisters rise. A height and gigantic pillars of stone. ‘Hakon Jarl’ was published in The St. James’s Magazine (February, 1866). What stops life’s strong action? “Give the horn to Freya! * The holder of the precious fruit whereby the gods continually renewed their immortality. Witch’d the hearts of all. All the white pearls small. “Take the gift, O Ydun! ‘The Gift of Ægir’ was published in The St. James’s Magazine (March, 1866).